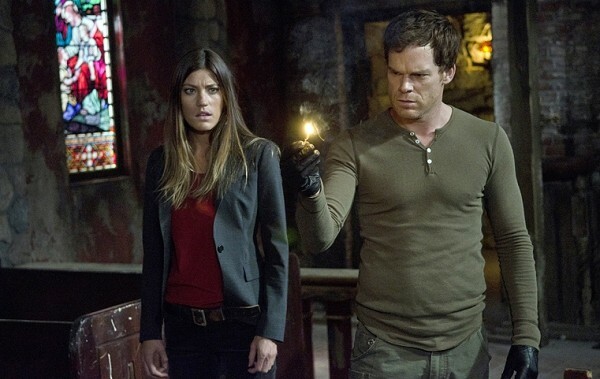 Season Premiere: Spoiler: Deb (Jennifer Carpenter) now knows her brother/ick-crush Dexter (Michael C. Hall) is a killer, having walked in on him plunging a knife into last season’s best-forgotten Baddie du Jour on the ritual table. But is the least-observant police detective in Miami aware of the serial extent of Dex’s résumé? Not yet, and there’s a new subplot involving Ukrainian mobsters and strippers (never a good combo), not to mention the leftover one about lab intern Ryan’s (Josh Cooke) beef with Dexter, and LaGuerta (Lauren Velez), the second-least-observant police detective in Miami, finally stumbling upon some evidence that just might clear her dead Season 1-2 pal Doakes. Tonight’s Season 7 opener is a somewhat messy setup for next week’s episode, which sets a clearer trajectory toward next year’s Big Finale blowout. Patience. Series Debut: Jonny Lee Miller goes all in to out-quirk Robert Downey Jr. as a modern-day Sherlock Holmes in Elementary—seriously, dude has more ticks than Wilfred in a weed patch next to a whorehouse. Miller’s Dr. House-via-Johnny Rotten performance almost pops off the screen and sneers, which goes a long way toward helping you forget that this is essentially another CBS crime procedural and that’s Lucy Liu right there playing Watson. Series Debut: When a U.S. military submarine (commanded by Andre Braugher and Scott Speedman) refuses to follow an unverified order to nuke Pakistan, it’s attacked by Forces Unknown and washes up on the island Sainte Marina. The crew are now labeled U.S. traitors, and it’s up to them to unravel the vast governmental conspiracy, clear their names and get back home, or just make a new one on this exotic island—seems like an easy choice if you’re not trying to squeeze out 13 or more episodes. Shawn Ryan (The Shield, Terriers) is the mind behind this, so the characters—and there are a lot of ’em—come first, making Last Resort add up to more than just Lost meets Homeland. Series Debut: An impossibly gorgeous New Jersey lawyer (impossibly gorgeous Janet Montgomery), despite her lack of an Ivy League education, lands a job at a Manhattan law firm. Before you can say “Didn’t Suits already do this on USA?”, the boss (Kyle MacLachlan) notices her wrong-side-of-the-tracks moxie and assigns her to a high-profile murder case. Bada-bing, bada-boom, we’re off to the freakin’ races over here. Apparently, only a Made in Jersey girl would know how pliers and other blue-collar implements work, and her Italian family is a 12th-gen knockoff of every New Jersey stereotype ever conceived—even the one or two that didn’t get reality shows. Series Debut: “From the producers of Gossip Girl and Pretty Little Liars” doesn’t exactly instill the right kind of fear for a supernatural series, and even nicely creepy performances from Terry O’Quinn (Lost) and Vanessa Williams (Ugly Betty) as, ostensibly, Mr. and Mrs. Satan, can’t quite kick this shiny hearse into gear. A young ’n’ dumb couple (Rachael Taylor and Dave Annable) move into 999 Park Avenue (under-lit shadows make it 666 Park Avenue—get it?) as building managers and eventually learn that all of the residents have struck Faustian-ish bargains with owners the Dorans (O’Quinn and Williams). Will any of them ever be allowed to leave? Only if they want to “move somewhere … warmer.” These are the jokes, folks.